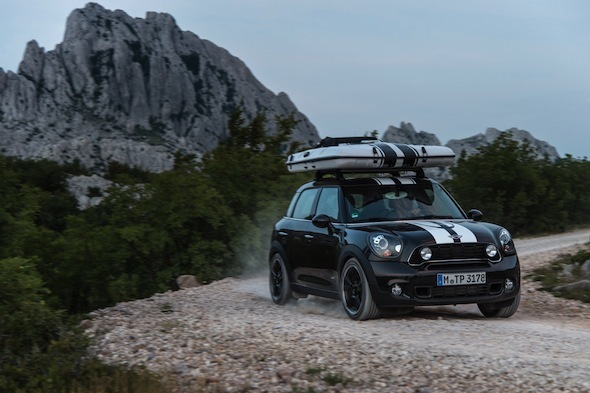 Mini has unveiled a trio of concepts that aim to tap into a nation's love of the great outdoors by featuring small, towable caravans, rooftop tents and interior sleeping solutions. First up is the Mini Clubvan Camper that comes ready-fitted with all of the gadgets and sleeping arrangements one would expect from a larger, luxury caravan. Inside, there's a television for the rainy days, an auxiliary heater and a retractable glass roof for late-night stargazing. There's even a hand-held shower so campers don't have to visit the shared facilities. For those wanting even more personal freedom there is the Mini Cowley, a compact caravan that can easily be towed by any of the feisty hatchbacks in the Mini range. The Cowley caravan boasts enough room to sleep two people; a twin-burner gas stove and a full sink facility for washing dishes. All of that luxury – including a TV and DVD player – weighs in at just 300kg, reducing impact on fuel efficiency and performance. Finally, the ALL4 Camp features a pop-up roof-tent that makes impromptu stops at isolated destinations both safe and comfortable. The innovative sleeping arrangement is fused to a four-wheel-drive Countryman, meaning difficult terrain is easily tamed. Mountain bikes can also be transported thanks to the built-in bike rack, enabling keen explorers to reach even the most remote areas. The three models have been created as concepts to show off the Mini range for now but the marque hasn't ruled out a range of camping-inspired accessories.